Humans have long dreamed of building an elevator between the Earth and the stars, with Russian scientist Konstantin Tsiolkovsky describing it as a “celestial castle” when he originally had the space elevator vision back in 1895. Tsiolkovsky originally came up with the idea after seeing the newly constructed Eiffel Tower, with another Russian, engineer Yuri Artsutanov, looking into the practical applications and challenges of the space elevator in the 1960s. Researchers from Japan’s Shizuoka University have now taken the lead, with two tiny satellites about to be deployed from Kibo, a Japanese Aerospace Exploration Agency-owned space module. The two 10cm square satellites will be released from the International Space Station after being delivered on September 11. The satellites will be released with a cable between them, with an even smaller motorised cube set to function as a miniature elevator car. As the car moves along the cable between the satellites, scientists will monitor the action via camera and record all of the movements that take place. According to research team leader Yoji Ishikawa, "It’s going to be the world’s first experiment to test elevator movement in space... In theory, a space elevator is highly plausible. Space travel may become something popular in the future.” If the data that comes back from the experiment is promising, we could see the birth of a safe and low-cost gateway into space. While there's a lot of technological issues that need to be addressed, a working space elevator would be a game-changer for space research and off-world transportation. There is already commercial interest in the idea, with Japanese firm Obayashi Corp participating in the study. Having already built the largest tower in Japan, Obayashi Corp have much bigger ambitions to build six space elevators, each measuring 18m in length by 7.2m in diameter. With the ability to carry 30 people and move at 200km/h, these oval shaped elevator cars would be able to move from the ground into space in about eight days. Once working, electromagnetic vehicles would be able to transport workers, equipment and tourists into space for a fraction of the cost of a rocket ride. The Japanese technology industry and wider national culture are supportive of the idea, which many see as an extension of their already bustling robotics and nanotube industries. 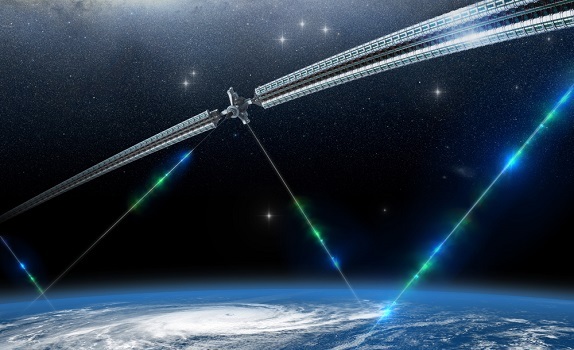 Despite ongoing research, however, a space elevator would need to use carbon nanotubes or other lightweight materials that are yet-to-be-developed. It would also require about 90,000km of cable and roughly $125 billion for this inspired idea to come to fruition. There are also numerous other hurdles to overcome, including the development of electromagnetic vehicles to ride the cable, and the discovery of a suitable counterweight, such as a small asteroid, that could be moved into place to tether the cable.